I gave this story a three hearts rating because this book could be combined in the second book. I did not like to read the suffering of Mare under Maven’s authority. It is common sense that Maven would try to dominate Mare in anyway. I just don’t see the point of having it as a whole book. However, I liked that the author has still something to surprise me. I love that a diversity of characters are in the story now. As a 500 page story, I was bored by it because the progression of the story was slow. I am used to reading a lot of action and battle scenes between silvers and reds that this book has fallen short from my expectation. This has made me think twice in reading the last book. I know that the end is near, but if the fourth book is like this, I can’t promise that I would finish it at once. Disclaimer: This review is my honest opinion on the story. I did not receive any kind of compensation for reading and reviewing this book. I am under no obligation to write a positive review. 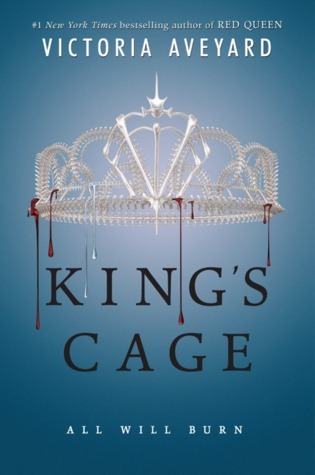 I purchased my own copy King’s Cage by Victoria Aveyard. The book photo and synopsis here is from goodreads.com.